When Nicole Thomson first heard about the importance of teaching spatial reasoning and geometry in her kindergarten math curriculum she had already been teaching for several years. Her teacher training program hadn’t mentioned these skills, and yet at a professional development session for math teachers a group of researchers from the University of Toronto explained the large body of research that ties spatial reasoning skills to future success in math and reading. The National Council of Teachers of Mathematics (NCTM) recommends that spatial reasoning should be a large focus of preK - 8th grade math education. “At first we had no idea what it meant,” Thomson said, but as the researchers explained cognitive science studies showing the power of spatial reasoning in the early grades they were gradually convinced that it was worth trying. 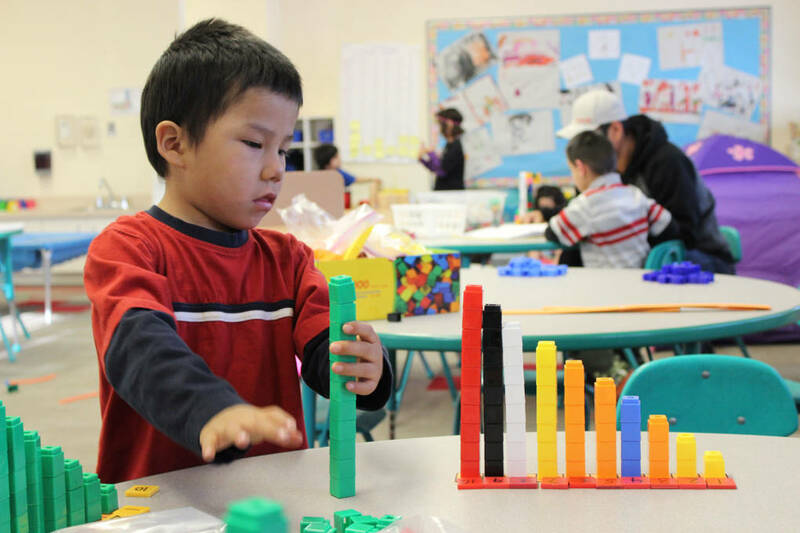 Early elementary teachers like Thomson in select Rainy River District schools began using Math For Young Children lessons designed by the researchers. The lessons focus on specific spatial reasoning skills like mental rotation, visual spatial reasoning, and spatial vocabulary all done in a playful, exploratory style that is developmentally appropriate for students ages four to eight. “We would take those lessons and games and think about what else we could do with these. How could we extend it, what could we try?” Thomson said. She and her colleagues would take the lessons researchers developed in a lab and try them out in their classrooms, returning to the next professional learning session with feedback and examples of how they’d modified or extended activities. 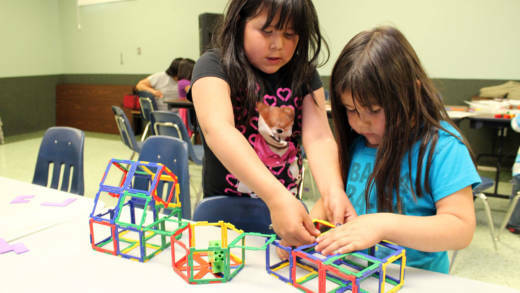 “Everything is supposed to be exploratory and it comes from the kids,” Thomson said. She noted they particularly love pattern blocks, which are like puzzles to them and tend to calm them down. 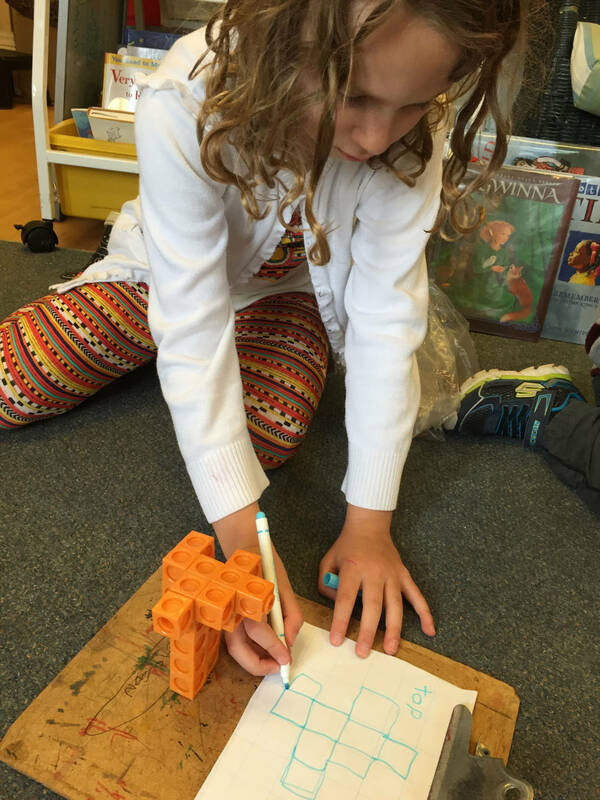 She doesn’t ever lecture her students on how to use the spatial reasoning tools, but rather sets kids a challenge and lets them figure out how to put the blocks together. Often she’ll lead them in one group activity and then leave the materials out around the room so kids can play with them during free time as well. A favorite lesson is the “magic key” activity where she puts on a witch hat and explains to her kindergarteners that a witch has hidden a treasure behind a door, casting a spell to lock it. She then gives them a set of pentominoes which contains five squares, and tells students their job is to find as many ways to combine the squares with one full side touching as they can. The more combinations they find the better their chances are of locating the key. “They discover within the half hour that there are 12 of these keys and we can’t make more,” Thomson said. As she and her colleagues experimented with spatial reasoning activities like this one, they were consistently amazed at how much more young students could do than they expected. And because the activities largely deal with manipulating shapes, practicing mental rotations and talking about positional language, kids who struggle with more traditional numeracy exercises were shining. “We started making sure we labeled this as math,” Thomson said. Before, kids thought math was just numbers, but when she worked to broaden the definition to include spatial reasoning tasks and toys they suddenly started to really enjoy math time, often choosing to play with materials during choice time. Thomson said she was so impressed with the results she was getting that she focused almost exclusively on spatial reasoning, neglecting other kindergarten concepts like patterning and numeracy. That made her a little nervous, so she was surprised and delighted when her students still performed well on those more traditional math concepts by the end of the year. That direct experience of success validated the research the Math For Young Children team presented. “It was good for me to see how important it was,” Thomson said. She’s now pulling the spatial reasoning tasks in more, connecting numeracy concepts like the number line to spatial and geometry concepts. She’s has students use blocks on number lines to help them understand the concept of magnitude, for example. Cristol Bailey also began using spatial reasoning in her classes several years ago. At that time she taught at a rural school with a high First Nations population. Bailey taught special education, but many of the students were underachieving even without that categorization. She says she was skeptical of spatial reasoning, but it was a “seeing is believing situation” for her. She began to see her entire math program through a spatial and geometry lens. Even when students were doing number sense activities she would encourage them to gesture with their hands or visualize the number line. She found often kids didn’t have the language to describe spatial positioning, but as they used their hands to gesture they began to find the words. “We went into it with a sort of learning trajectory in mind and most of the time they far surpassed what we thought they’d be capable of,” Bailey said. She now teaches Grade 2 students, most of whom have had spatial reasoning lessons since kindergarten. They’ve mastered many of the tasks, but she still finds more difficult ones to grow their skills. One favorite is the “hole punch symmetry challenge,” in which students imagine punching a hole in a folded up piece of paper. As the paper unfolds, where will the holes be? “It is my struggling paper and pencil kids who nailed it right off the bat, which was really surprising and great because I was not expecting that,” she said. In Ontario, students take an important standardized test in Grade 3 called the EQAO that determines whether they are on grade level. That means that even in Grade 2 there’s pressure to cover a broad array of topics and anxiety that kids won’t be ready. Teachers go over diagnostic data at divisional meetings, creating lessons to target concepts and skills that students haven’t mastered. Bailey has noticed that students often struggle with tasks that involve spatial sense, a further indicator to her that spatial reasoning should be the norm in every early elementary classroom. While she still uses spatial reasoning in her Grade 2 classroom, Bailey admits that without the support of colleagues working to adapt the materials to this grade level it’s more of a challenge. She thinks her experience with the Math For Young Children team and curriculum has changed her teaching forever, but wishes it was more of a priority even as kids get older. Perhaps just as important, the experience of working with math researchers and colleagues to refine lessons has her thinking about going back to school for another degree on how to better teach math. There’s a well-known rift between those who believe the only type of developmentally appropriate early childhood education is a play-based one, and those concerned that relying solely on any learning that comes out of play could put students coming from impoverished backgrounds at a disadvantage. Research has shown that students from lower socioeconomic groups enter school with significantly less mathematical knowledge, and it is difficult to overcome that gap without intentional mathematics programming. But, at the same time, traditional teacher-led instruction often isn’t developmentally appropriate for five-year-olds. “This project started as a way to show young children engaged in rigorous mathematics in ways that were play,” said Joan Moss, Associate Professor Emerita at the University of Toronto’s Ontario Institute for Studies in Education. She stresses that while math learning doesn’t only emerge from play, as some insist, the activities are still developmentally appropriate because they are presented playfully; students have lots of choice, there are many entry points, and while there are right answers, teachers build a culture in which getting a wrong answer isn’t bad. 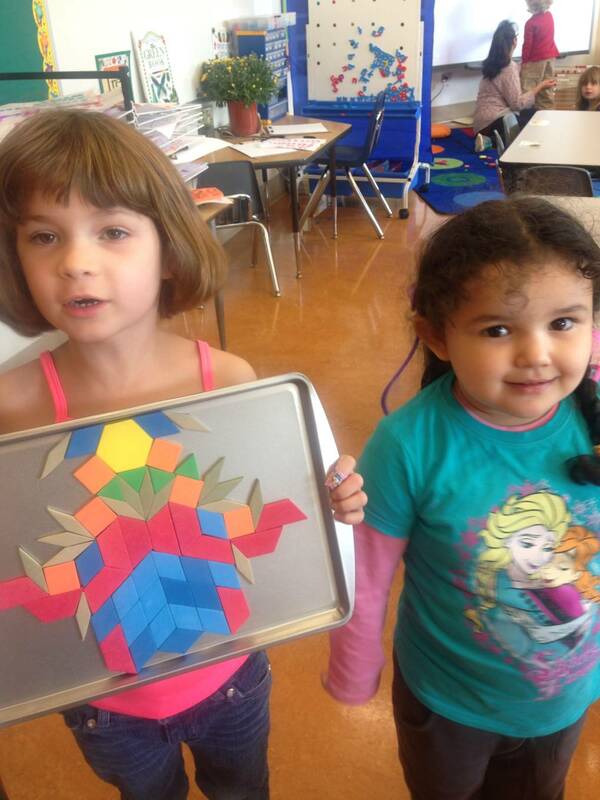 For example, in the “quick image activity” the teacher flashes a complex pattern made out of pattern blocks. Students see it for a very brief time and then try to recreate it themselves. After working for a bit they get to see the original image again and make fixes to their original attempts. Hawes and Moss say a lot of learning happens in the fixing. In addition to demonstrating that well-trained teachers can teach math concepts in developmentally appropriate and playful ways, the Math For Young Children project has been an experiment in a more collaborative type of professional development. The university researchers are working alongside classroom teachers to fine tune lessons and evaluate how well they work. The Rainy River School Board teachers who were the first participants kept logs of when they used spatial reasoning activities, how long they took, and the tweaks they made. They brought feedback from the classroom back to researchers, and used a lesson study approach to improving the lessons together. Joan Moss says this collaborative model of professional development, featuring teachers working alongside researchers to build quality activities grounded in research and classroom practice has been thrilling and a huge part of the program’s success. Teachers agree: “To be able to get together with people with that much math knowledge, it was an amazing experience,” Cristol Bailey said. The University of Toronto team evaluated the Math For Young Children program as it was being implemented in the Rainy River schools. Since teachers of the experimental group were engaged in inquiry-based professional development with researchers around spatial reasoning, the control group’s teachers also had interaction with researchers on a different topic. This was meant to make the groups more similar in exposure, but with different focuses. After the first year, students in the experimental group made significant gains on assessments of geometry, spatial reasoning and numerical skills compared to the control group. In the second year, researchers decided to test students on the KeyMath measures, which are used to assess school-based mathematical concepts and skills. Students in the experimental group showed significant gains on those more traditional measures as well (a paper with these findings will soon be published in Cognition and Instruction). The first class of students will take the EQAO this year, and researchers hope they will show increased learning over peers in the rest of the province. The Ontario Ministry of Education is interested in spreading the spatial reasoning work that the researchers started. Hawes and Flynn wrote a document titled "Paying Attention to Spatial Reasoning" that the ministry distributed to educators across the district. ** Individual school boards are also showing interest in training and implementation. *The article has been updated to note that Cathy Bruce helped lead the Math For Young Children research, which is taking place in several locations around Ontario. **The article has been updated to include Tara Flynn’s contribution to the document. We regret these errors.